Values are the lights that guide us, that give us courage to step into fears & risk. The answers can often be telling. "If I wasn't wrestling with fatigue all the time, I would get up and spend time with my friends, call family more often, keep my home cozy & inviting, exercise and make homemade meals." This is someone who values relationships & health. Or, "If I weren't so afraid, I would smile more, practice often, ask for more opportunities, and actually put my name out there." This is someone who values courage & creativity! Think about something you've been struggling with lately. Ask what your life would look like if that struggle went away. Make a list of all the things you would be doing from day to day. Can you see any patterns about what you find important? Even if the struggle remains, how can you start living that out today? The funny thing is, we often feel like we have to get over certain things (fear/pain/risk/etc.) 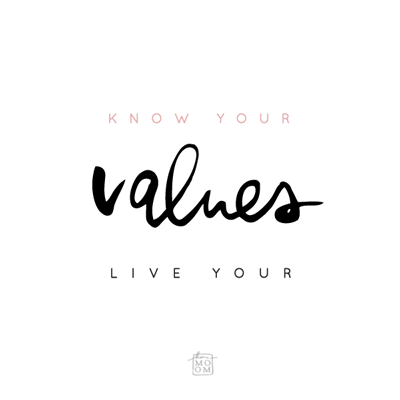 before we can live out our values. But what if we don't have to wait for the struggle to disappear; what if we could choose to act towards our values now? This post is part of a series on Acceptance & Commitment Therapy, where I share bite-sized concepts from my training and how they relate to everyday life, wellness & creativity.